Strawberries provide an outstanding variety of phytonutrients, including anthocyanins (especially cyanindins and pelargonidins); flavonols (especially procyanidins, catechins, gallocatechins, epicatechins, epigallocatechins, kaempferol and quercetin); hydroxybenzoic acids (especially ellagic acid); hydroxycinnamic acids (including cinnamic, coumaric, caffeic and ferulic acid); and stilbenes (including resveratrol). Strawberries are an excellent source of antioxidant-promoting vitamin C and manganese. They are also a very good source of dietary fiber, iodine and folate. Plus, strawberries are a good source of copper, potassium, biotin, phosphorus, magnesium, vitamin B6 and omega-3 fatty acids. 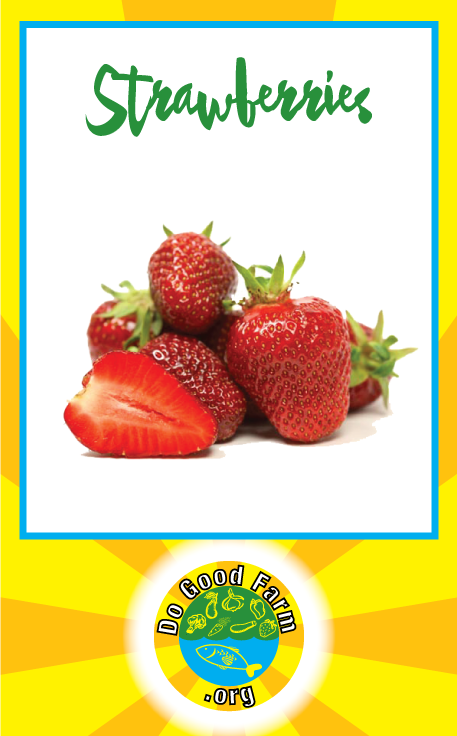 The benefits of consuming fruits and vegetables of all kinds, including strawberries, are varied. As plant food consumption goes up, the risk of heart disease, diabetes, and cancer goes down.A high intake of fruits and vegetables is also associated with healthy skin and hair, increased energy, and lower weight. Increasing consumption of fruits and vegetables significantly decreases the risk of obesity and overall mortality. Heart Disease: A Harvard study found that regular consumption of anthocyanins, a class of flavonoids found in berries, can reduce the risk of a heart attack by 32 percent in young and middle-aged women.Women who consumed at least three servings of strawberries or blueberries per week fared best according to lead study author Aedin Cassidy, Ph.D., a nutritionist at the Norwich Medical School in the United Kingdom.The flavonoid quercetin, contained in strawberries, is a natural anti-inflammatory that appears to reduce the risk of atherosclerosis and protect against the damage caused by low-density lipoprotein (LDL) cholesterol in animal studies.Quercetin may have the additional bonus of anti-cancer effects; however, more studies are needed using human subjects before these results can be confirmed.The high polyphenol content in strawberries may also reduce the risk of cardiovascular disease by preventing platelet build-up and reducing blood pressure via anti-inflammatory mechanisms.Other studies have shown that eating strawberries helps to lower homocysteine levels, an amino acid in the blood associated with damaging the inner lining of arteries.The fiber and potassium in strawberries also support heart health. In one study, participants who consumed 4,069 milligrams of potassium per day had a 49 percent lower risk of death from ischemic heart disease compared with those who consumed less potassium (about 1,000 milligrams per day). Cancer: Strawberries contain powerful antioxidants that work against free radicals, inhibiting tumor growth, and decreasing inflammation in the body. Blood Pressure: Due to their high potassium content, strawberries are recommended to those with high blood pressure to help negate the effects of sodium in the body. A low potassium intake is just as big a risk factor for developing high blood pressure as a high sodium intake.According to the National Health and Nutrition Examination Survey, fewer than 2 percent of American adults meet the daily 4,700-milligram recommendation for potassium.Also of note, high potassium intake is associated with a 20 percent decreased risk of dying from all causes. Constipation: Eating foods that are high in water content and fiber, like strawberries, grapes, watermelon, and cantaloupe can help keep you hydrated and your bowel movements regular.Fiber is essential for minimizing constipation and adding bulk to the stool. Allergies and Asthma: Because of the anti-inflammatory effects of quercetin, consuming strawberries may help to alleviate symptoms of allergies, including runny nose, watery eyes, and hives; however, to date, there have been no human studies done to prove this theory.Several studies have shown that the incidence of asthma is lower with a high intake of certain nutrients, vitamin C being at the top of the list.